University’s first black students, brothers Solomon and Benjamin Butler. The Butlers, who entered classes in fall of 1915, certainly deserve more attention along the lines of what the University gave them in 2014's exhibition and catalog Racing Past the Color Line: Sol Butler and Paul Robeson in Collegiate Athletics. Their collegiate experiences placed their school ahead of the curve in terms of racial equality in higher education. In an effort to balance our coverage, however, we now focus on the experiences of African American students who came after the Butlers. Perhaps none of these alums achieved the same degree of international fame as did Olympiad Sol Butler, but our research convinces us that many have stories as compelling as that of a world-class athlete. More than just a commemoration, then, Ahead of the Curve celebrates the hard work, dedication, success, daring, and spirit of inquiry of students whose lives shaped and were shaped by UD. This digital exhibit commemorates and celebrates African American students at UD by providing a levelheaded look at their myriad experiences – good and bad – on campus and within the broader community. 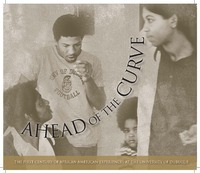 Toward this end, Ahead of the Curve features the research insights of burgeoning and seasoned historians and a wealth of memories from dozens of alumni.